Click image to enlarge Captured from television news, D.B. Cooper, 40 years later, KOIN TV. Image taken November 23, 2011. In 1980 money from skyjacker "D.B. Cooper" was found on the Columbia River shoreline at Tina Bar. Tina Bar is the local name for a stretch of beach located along the Washington side of the Columbia River at River Mile (RM) 97. Upstream is Caterpillar Island and two miles downstream is Post Office Lake, the location of Lewis and Clark's campsite of November 4, 1805. Tina Bar borders on the property of the Fazio Brothers Sand Company. Tina Bar is where, in February 1980, a nine-year-old boy found remains of some of the ransom money of skyjacker D.B. Cooper. In 1971 a "Dan Cooper" skyjacked a plane, demanded money, and then jumped. Initially investigators thought Cooper jumped while over Ariel, Washington, on the Lewis River Drainage. However, with the money being found upstream of where the Lewis River merges with the Columbia River, it is now presumed that Cooper possibly jumped while over the Washougal River Watershed. In July 2016, after 45 years of searching, the FBI closed the D.B. 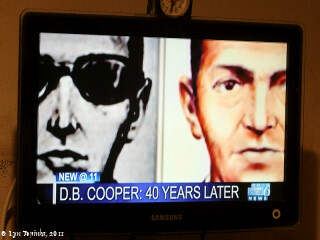 Cooper case, leaving this to be the only unsolved skyjacking in American history.